Ironically, we feasted at night. But there was a heat lamp. Pre-dinner cocktail. Smith & Cross Navy Strength Pot Still Rum (Daiquiri), from the creator of the cocktail himself (our server Brian). (Applause). Appetizers. MUH-FKN Mofongo. Yucca Fries. Sunfire Salad. Expletives not included. Feast. Pineapple pork chop, Pirate-style Fisherman’s Stew, and Jamaican roasted lamb. Land and sea, covered. The cocktail. I couldn’t hear much above the general background banter, but I believe the cocktail contained rum, fresh-squeezed lime, as well as a touch of sugar. Brian went on to describe the cocktail as some sort of moving contraption. I heard something along the lines of “ the rum cycles throughout the drink, and finishes off with a fresh hint of lime.” That got me thinking about the properties of alcohol. Is the drink alive? Technically, it’s not more alive than a green, fermented, probiotic “health” drink. Alcohol is less dense than water, and is soluble in a variety of environments; it can disrupt lipids (fat), as well as immerse in aqueous solutions. These qualities of alcohol are what give it its inebriating effects, as the disturbance of our lipid membranes and proteins attribute to the wonderful (or not so wonderful) effects of intoxication and hangovers. Its lighter density compared to water makes layering drinks possible (we’ve all done those tacky experiments where water and oil don’t mix). By mixing alcohol and aqueous layers (usually juices of varying color and taste) and tweaking with the alcoholic content of each layer, I would suspect that the more alcohol present, the lighter the layer. Therefore, in most layered drinks, I suspect it to start off super strong. I can’t recall if I experienced this during the daiquiri, but the first sip definitely was powerful. Whether or not the lime came in last place is beyond my memory capabilities. Or maybe I just drank too much. I am, after all, a one shot wonder. The entire concept, however, is worth thinking about, the next time you order a cocktail. I have to comment on the lamb, as it was a somewhat disappointing. I’m a huge lamb connoisseur, and the lamb served at Sunny Spot was short of noteworthy. As described to us, the lamb was marinated for 36 hours, and then slow roasted/braised until ridiculously tender…at least according to our server. When it arrived, the presentation did not entice me to the dish. Honestly it looked like a blackish hunk of meat hidden under what seemed to be a supremely thick sauce, accompanied by plain, dry-looking lettuce leaves and a couple slices of mango. Upon tasting, the lamb seemed a bit stringy on the tongue, which made me think that sourcing a correct cut of meat is vastly more important than how it is subsequently cooked. “Back to the roots,” they always say; fresh, quality ingredients always confer higher quality meals, regardless of cooking technique. No amount of technique will save an expired, crappy, or improper slice of meat. Part of tender-fall-off-the-bone type of meals seem to involve the correct cuts of meat; usually the cuts with ample, or at least some, marbling. Tenderness also depends on how much work the muscle as done in its lifetime, and whether the cut has been dry aged or not. If we apply this analogously to a steak, the difference can be seen between, let’s say, a ribeye, chuck roast, and filet mignon. The ribeye possesses marbling, intramuscular fat that can be seen, striated among the muscle fibers. Fat provides flavor, and perceived juiciness, from our own saliva. Yes, the “juiciness” of a steak is actually not due to “searing the juices in” while cooking or other nonsense (although the meat itself does contain moisture). Juiciness arises from the fact that searing creates caramelization, caramelization and color equals flavor, and flavor causes us to salivate. So searing and intramuscular fat imparts flavor and salivation- thus, delicious, moist meat. 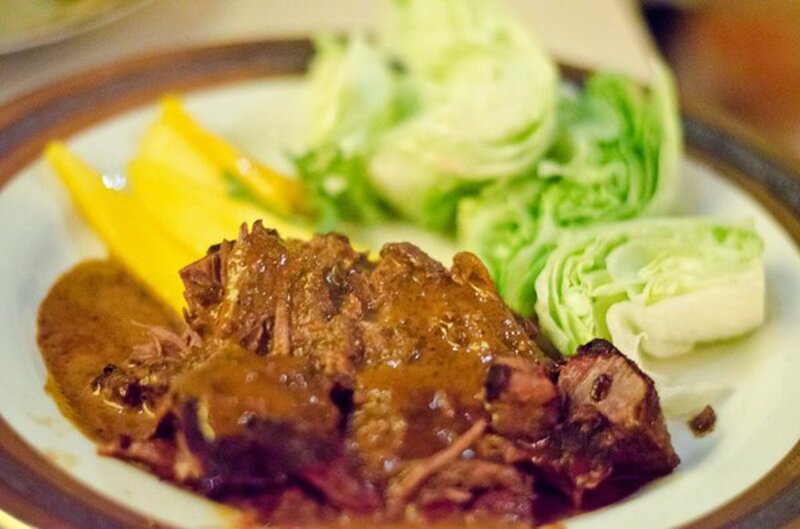 Chuck roast is usually referred to as a cut suitable for pot roasts, as it is tough, due to the location of the cut (around the shoulder of the cow). More muscle use means less tender meat, as the muscles are strong and tough. Filet mignon, is found near the back of the cow, right before the hind legs. Less muscle use. More relaxed. More sitting around. Tender. Yummy. smile Expensive. smile drops from face. Flex your own bicep; would you rather eat your bicep or your forearm? I’d say your forearm would be less tough. I’m by no means advocating cannibalism. That aside, the muscle less used usually equates more tenderness, barring the effects of intramuscular fat. I suspect that the lamb was a rather lean cut, regardless of how it was cooked, the moisture would eventually leave it, conferring meat that fell apart, but did not retain moisture, or any “salivating qualities.” Usually these types of roasts are hidden under massive amounts of gravy or sauce, which in this case, was very salty. However, when a piece of the lamb was taken in with a piece of the mango, the taste was much more pleasant. I attribute this to the water inside the sweet mango, and the slight acidity and sweetness that cut through the savory aspects of the dish. Overall the night was dry. I sat under a heating lamp, had a strong cocktail, and stringy lamb. I hope it rains soon.